Ben Quayle is most known for his role as an American politician as well a Republican U.S. Representative for the third congressional district of Arizona. Ben Quayle was born in Fort Wayne, Indiana on November 5, 1976 as the second son to his father, the former Vice President of the United States. He was just born only three days after his father was elected into the U.S. House of representatives. Ben Quayle often found himself visiting the White House along with the rest of his family during the Regan presidency. Ben Quayle attended Duke University and graduated with a Bachelor of Arts in history in 1998 and then went on to receive his Juris Doctor in 2002 from Vanderbilt University Law School. After school, he worked as an associate in the Schulte Roth and Zabel law firm and after the Snell & Wilmer law firm. He then became the founder as well as the managing director of Tynwald Capital, which was a law firm that specialized in acquiring and nurturing small businesses. He then became a APG-Southwest along with the Managing Partner of the Arizona Branch of APG Security, which provided various security services for businesses. 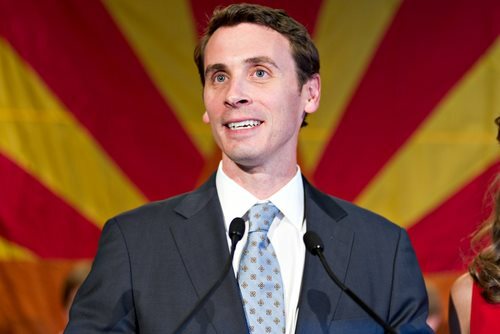 In the 2010 election, Ben Quayle ran for the seat of the 3rd congressional district of Arizona, which he won by defeating Green Party nominee Leonard Clark, Libertarian nominee Michael Shoen, and Democratic nominee Jon Hulburd. He then succeeded 8-term Republican Representative John Shadegg and took his place as a Representative. o Ben Quayle feels the act should be replaced with medical tort reform. · Supports the second amendment which allows law abiding citizens to possess and bear arms. · Suggests lowering taxes and revisiting regulations that detriment job growth. · Promotes furthering education reform in order to destroy bureaucratic roadblocks that prevent school teachers and administrators from successfully doing their jobs. · Supports veteran’s benefits by providing quality care for those who protect the country.